This week marks the tragic anniversary of the Rana Plaza disaster, as part of this we plan on bringing you new stories every day of ethical brands who ensure their products are fairly made, alongside organisations who are working to make a difference. To kickstart the week of articles we asked Carry Sommers, founder of Fashion Revolution to tell us more about #FashRev and how we can do more to prevent future tragic events. On 24 April 2013, 1134 people were killed and 2500 injured when the Rana Plaza factory complex collapsed in Dhaka, Bangladesh. We believe 1134 is too many people to lose from the planet in one factory on one terrible day without that leading to revolutionary change in the fashion industry. The Rana Plaza was a metaphorical call to arms. We are people from all around the world who make the fashion industry work. We are the people who wear clothes. And we are the people who make them. 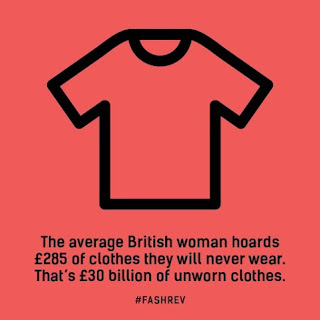 And we want to ignite a revolution to radically change the way our clothes are sourced, produced and purchased. We have named the anniversary of the Rana Plaza disaster Fashion Revolution Day. This year, Fashion Revolution Day falls on a Sunday, so we have created Fashion Revolution Week: a week of activities around the world to demand a fairer, cleaner, more transparent and more beautiful fashion industry. 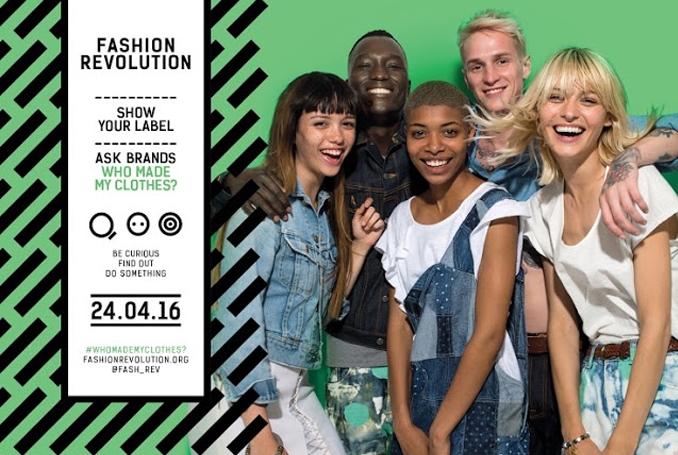 Fashion Question Time at the Houses of Parliament will be held on Monday 18th April and will mark the start of Fashion Revolution Week. The global fashion industry is opaque, exploitative and environmentally damaging and desperately needs revolutionary change. Fashion Revolution wants to ignite a revolution to radically change the way our clothes are sourced, produced and purchased. We believe transparency is the first step to transform the industry, and it starts with one simple question: who made my clothes? Who Made My Clothes should be a simple question. Most people would expect a brand to at least know the final factory where their garments are cut and sewn. The Behind the Barcode Fashion Report published last year found that 48% of brands hadn’t traced the factories where their garments were made, 75% didn’t know where their fabrics came from and 91% didn’t know where the raw materials came from. Do you think Fashion Revolution has a chance of changing anything? Change is possible. There is a huge body of evidence which shows that people can radically transform their behaviour or beliefs in the face of the right kind of impetus. Most of the public is still not aware that human and environmental abuses are endemic across the fashion and textiles industry and that what they’re wearing could have been made in an exploitative way. We don’t want to wear that story anymore. Fashion Revolution has already begun to spark a global conversation about the social and environmental issues facing the fashion industry. We have been been particularly successful over the past three years at engaging the public in these issues and giving them tangible ways to become part of the solution. We have created a How To Be A Fashion Revolutionary booklet this year which is full of inspiration and ideas about how we can all use our voices and power to transform the fashion industry as we know it. We believe fashion can become a force for good. What do you say to people who were horrified at the disaster, but can’t afford to pay extra for ethically–sourced clothing? We’re not asking people to boycott their favourite stores, we need to change the fashion industry from within. By asking the brands and retailers where we like to shop Who Made My Clothes? we can put pressure on them to be more transparent about their supply chains. In terms of the price, three quarters of those questioned in a YouGov/Global Poverty Project survey said they would be likely to pay an extra 5% for their clothes if there was a guarantee workers were being paid fairly and working in safe conditions. 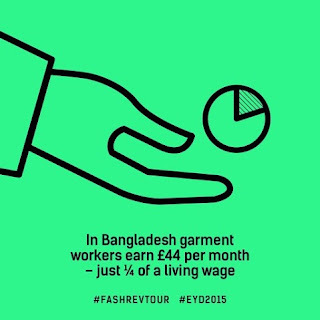 It has been estimated that putting as little as 25p onto the cost of a garment made in Bangladesh would provide the producers with a living wage and pay for factories to meeting fire and building safety standards. Has much has changed since Rana Plaza? Rana Plaza was inevitable. There are ever longer supply chains, and a resulting shift in responsibility. However, this was a tragedy that could have taken place in any fast fashion producing country. Rana Plaza happens to be in Bangladesh. What happened reflects a global trend of increased 'demand' which feeds the fast fashion supply chain. There have been many improvements in the fashion supply chain since the dust has settled on the Rana Plaza disaster, although it is unfortunate that it has taken a tragedy of this scale to start to bring about change. The Bangladesh Accord is a significant milestone towards better working conditions in Bangladesh, and hopefully throughout the industry. However, as we have heard through numerous recent reports in the media, 90% of the structural, electrical and fire-safety improvement plans are behind schedule. 13% of suppliers still haven’t removed locks from doors which could be used as fire exits. Fashion Revolution’s is working to re-connect the supply chain, showing the faces and giving a voice to the makers of our clothes, highlighting their stories, and showing where change still needs to happen.